The story of early mapmaking has always been about the conflict between innate beliefs and empirical evidence. The accuracy of maps was frequently distorted by partial, contradictory and misunderstood geographical and celestial data being forced to fit a flawed world view. Nowhere is this more striking displayed than in the magnificent astronomical charts of Andreas Cellarius. At the beginning of the European Renaissance celestial theory was principally based on those remnants of classical knowledge that had survived the intellectual destruction of the Dark Ages. 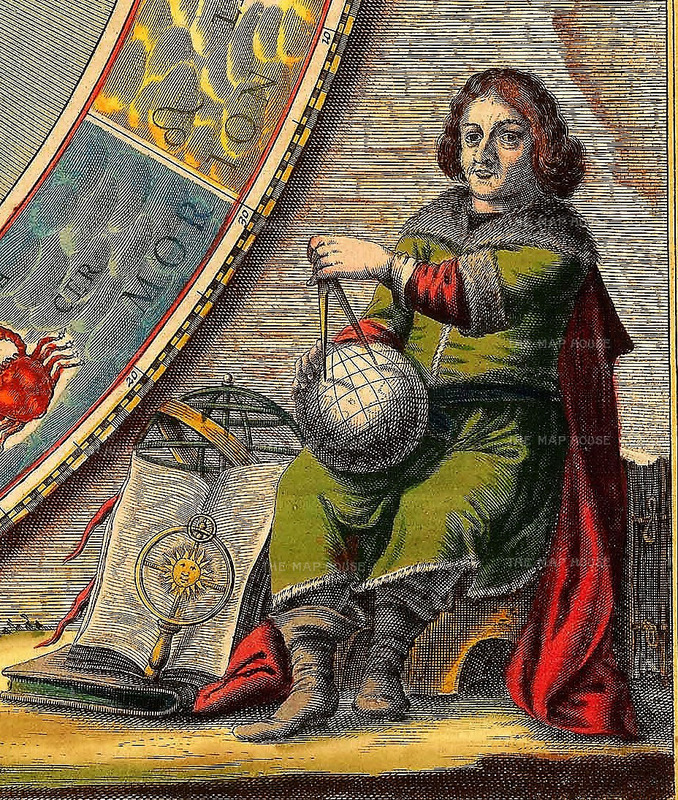 The most influential of these early cosmographers was Claudius Ptolemy who worked in Alexandria in about 150AD. Ptolemy places the stationary Earth at the centre of the solar system, around which the Sun, planets, and by extension the universe, revolve. References in the Bible to a “fixed, immobile Earth” appeared to endorse Ptolemaic theory. Ptolemy himself, with his fellow classical geographer, Strabo, are shown sitting in the lower corners. The heavenly bodies are represented by a chariot-borne god or goddess, each with their sacred beasts and associated colour. Apollo as the Sun is highlighted in splendid gold leaf, Mars is typically in red, Venus is green and Jupiter, as befits his rank, is highlighted in silver. Confusingly to the modern eye, the great ring of fire in the centre of the map does not represent the sun but, together with the band of clouds and the globe itself with its oceans, actually depicts the classical elements of Fire, Air, Earth and Water. The fifth and final Element, Aether was believed to fill the voids of space. One of the great transformative moments in human history and intellectual thought was the realisation during the 16th century that the Earth and therefore Man, was not the centre of our Solar System. This fundamental insight which was to revolutionise our perception of our place within the Universe was principally the work of one man, Nicolaus Copernicus. Copernicus, a Polish astronomer, polymath and all-round genius, recognised that the long-standing difficulty with the apparent retrograde motion of the planets (when the planets appear to go back on their tracks when observed from earth) could be explained once one accepts both a heliocentric solar system and a turning earth. This idea was so radical, even heretical, that Copernicus only published his theory in De Revolutionibus in 1543 over 30 years after he’d first formulated it and while literally on his deathbed. 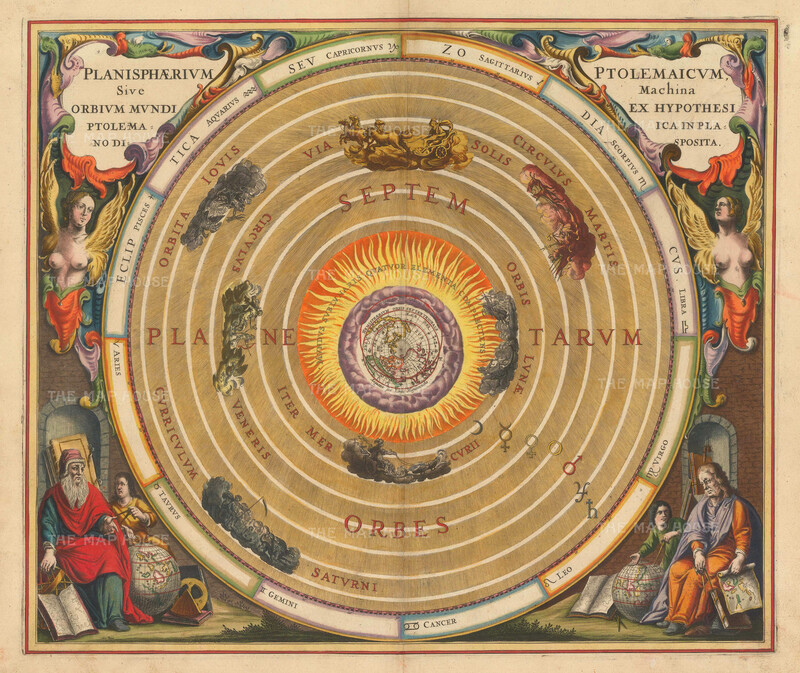 The theory of a heliocentric system was so antithetical to many astronomers, most of whom were churchman, that it was over sixty years after the publication of De Revolutionibus before the heliocentric system was generally accepted. During this interregnum astronomers such as Tycho Brahe struggled to formulate a compromise between classical astronomy and “modern” astronomy which didn’t compromise scriptural authority. This map illustrates the awkward result when immovable belief meets irresistible scientific evidence and demonstrates Tycho Brahe’s tortuous efforts to graft “modern” astronomical observation onto the outdated classical model. Brahe (1546-1601), a celebrated Danish astronomer, was a dedicated observer of the heavens and careful compiler of empirical evidence. He was the first astronomer to record witnessing a supernova (he actually coined the term “stella nova” for the phenomenon) and was the first to use this to challenge the Aristotelian belief in an unchanging celestial realm. His observations led him to conclude that the outer planets at least, did indeed orbit the Sun but he refused to relinquish the fundamental concept that the Sun, in turn orbited the Earth. He declared that a mobile or revolving Earth to be “in violation not only of all physical truth but also of the authority of Holy Scripture, which ought to be paramount”. 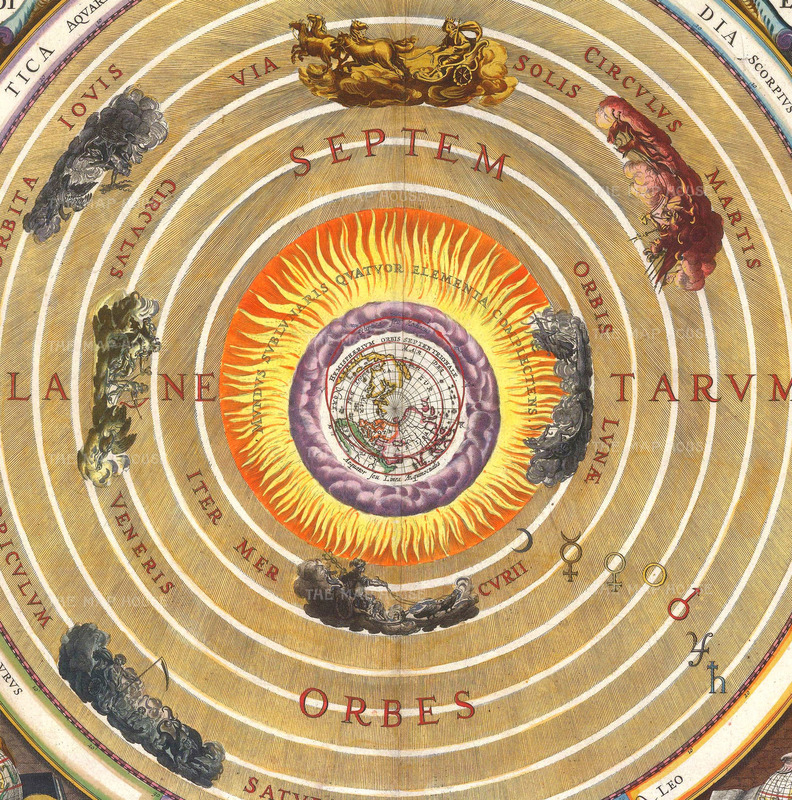 His model for the solar system gained a considerable following after 1616 when the Church in Rome officially ruled that that a heliocentric solar system was contrary to both philosophy and Scripture, and could only be discussed as a computational convenience that had no connection to fact. Here we have a portrait of Tycho Brahe himself. Sadly the 17th century colourist in liberally using gold leaf to highlight such features as the sun and the scientific instruments has resisted the opportunity to give Brahe a golden nose. As a young man, Brahe lost his nose in a duel and wore a gold or silver false nose for the rest of his life. He is also, rather remarkably, one of the few people to die as a consequence of excessive politeness. According to the first-hand account of Brahe’s assistant, the renowned astronomer Johannes Kepler, Brahe refused to leave the table to relieve himself during an interminable banquet in Prague considering it would constitute a dire breach of etiquette. As a consequence he ruptured his bladder and died in agony eleven days later. A salutary lesson to us all! 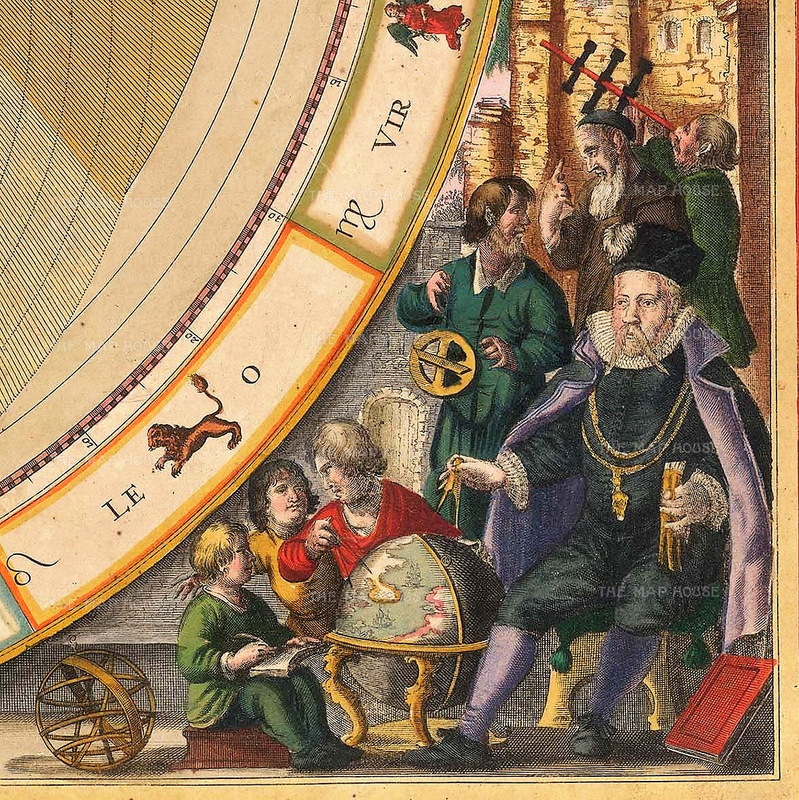 For more information about our collection of celestial maps, visit our website or email maps@themaphouse.com.